Ana Elisa Osorio, a leader of the Socialist Party, calls for solidarity with Venezuela’s government. Some 260 leftist political activists from 39 countries, mostly in Latin America and the Caribbean but including people from around the world, gathered in Mexico City from March 27 to 29. They joined hundreds from the hosting Labor Party (Partido del Trabajo or PT) at its 18th International Seminar. Some 100 speakers, from a broad range of left political positions, spoke on many subjects with a common thread: the danger posed by Washington’s aggressive posture toward all countries south of the U.S. border and especially toward the Bolivarian government of Venezuela. Other topics near the front burner were the March 15 election of Farabundo Martí National Liberation Front member Salvador Sánchez Cerén as president of El Salvador, the successful March 26 general strike in Paraguay, and the worldwide capitalist economic crisis and its accompanying high, long-term unemployment. They also discussed the continued U.S. intervention against Syria in the Middle East and against Ukraine in Eastern Europe, which has provoked a confrontation with Russia. Attracting even more participation than usual, the seminar featured American political leaders Carlos Fonseca of Nicaragua’s Sandinistas; former Honduran President Manuel Zelaya; Che’s daughter, Dr. Aleida Guevara of Cuba; professor Alberto Anaya, head of the PT; and Nidia Diaz of the FMLN of El Salvador. Elected officials from national legislatures of Venezuela, Nicaragua, Argentina, Costa Rica, Mexico, Bolivia and others were there, as well as comrades from parties in the governments of Brazil, Uruguay and Cuba. There were also representatives from parties in power in China, Vietnam, Laos and the Democratic People’s Republic of Korea. Daily mass organizing was also on the agenda. Yvonne Muñiz of Cuba, showed with a PowerPoint demonstration combining photos, videos and music, how the Cuban government has involved whole communities in planning and construction of public spaces. A speaker from Nicaragua underlined the gains made by women, who have more than 40 percent representation in the parliament, almost all from the Sandinista Front. Berta Joubert-Ceci, from Workers World Party USA, got a standing ovation when she pointed out the enormous advances in the participation of women in the seminar itself and their many contributions. 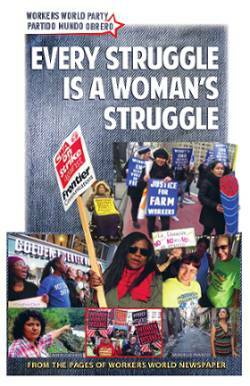 She then appealed for international actions in solidarity with the struggles of low-wage workers on all continents, including in North America. There was detailed discussion of the situation in Mexico, of which the most pressing issues at this time are the imperialist-promoted attempt to privatize the national oil company, Pemex, disguised as a “reform,” and the attack on various labor unions. While Venezuela was on the front burner at the seminar, the participants were also concerned with the imperialist-provoked civil war in Syria, which Lebanese activist Leila Ghanem reported on, and with the ongoing U.S. and European Union intervention in Ukraine that threatened to bring the NATO military alliance into a hostile confrontation with Russia on that country’s border. 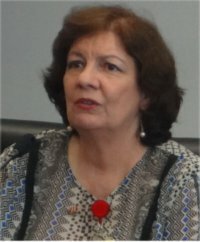 Ana Elisa Osorio, from the national committee of the governing Socialist Party of Venezuela, explained the situation in her country as of March 28: “There are still six of our 335 municipalities suffering from the actions of fascists backed by opposition mayors, and these actions have killed 37 people.” The corporate media, she said, have completely distorted the situation, charging President Nicolás Maduro with the deaths, which is the opposite of what really happened. While the current crisis in Venezuela may be under control, no one thought the attacks from “the Empire” were ending. In addition, many speakers saw the assault on Venezuela not in isolation but as an attack on the left governments, from the most social democratic to the most radical, in the entire region. While there have been tremendous electoral gains in many countries — starting with Hugo Chávez’s election in 1998 and from Argentina to El Salvador — in all cases, outside of socialist Cuba, the gains have been limited to a left party taking over the administration of the government. The governments range from barely left of neoliberal to social democratic to openly anti-imperialist, but nearly all share the aim of getting out from under the U.S. yoke. The state — that is, the armed forces and police — and the main media resources remain in the hands of the old ruling classes. In the best case the army is led by patriotic officers who pledge neutrality. This leaves the left governments in a fragile position. They can attempt programs that aid the workers and peasants, but are susceptible to economic and military pressure from the local oligarchs and from imperialism. As PT head Anaya pointed out, the imperialists were able to organize “a new type of coup d’etat,” for example, in Honduras in 2009 and in Paraguay in 2011, where the successor regime was quickly legitimized by an often fraudulent election. Cuban analyst Roberto Regalado raised the imperialist plan for what he called “positional warfare” to reverse the electoral gains in Venezuela, Ecuador, Bolivia, Nicaragua, El Salvador and other places. What was needed, he said, was to mobilize the masses and keep them politically conscious and active to combat this process. The Haitian delegation threw out a challenge to the seminar by asking those parties in countries whose military is participating in the Minustah occupation of Haiti to fight to have those troops withdrawn. Among the resolutions approved were those for the independence of Puerto Rico, for freedom for political prisoner Oscar López Rivera and all the Cuban 5 patriots from U.S. prisons, and support for independence of the Western Sahara. John Catalinotto and Berta Joubert-Ceci represented WWP at the seminar.